Each set features a mix of repaints with new and retooled characters! 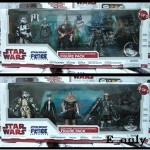 Could new figures from The Force Unleashed 2 be on the way too? Click on the title bar to see more!